Crewmembers on the International Space Station celebrate "Aloha Friday." From left to right: Joe Acaba, Alexander Misurkin, Mark Vande Hei, Cmdr. Randy Bresnik, Sergey Ryazanskiy and Paolo Nespoli. Today (Sept. 22) is the first day of autumn in the northern hemisphere, but the astronauts on the International Space Station squeezed in one last "Aloha Friday." Randy Bresnik, NASA astronaut and Expedition 53 commander, posted two photographs to Twitter of he and his crewmates wearing space-themed Hawaiian shirts (or Aloha shirts). The brightly colored short-sleeved shirts feature red and yellow planets, blue stars and purple gas clouds. "Our Earth is but an island in the cosmos," Bresnik wrote. "Exp 53 crew is embracing the island lifestyle with our @Space_StationHawaiians on #AlohaFriday!" 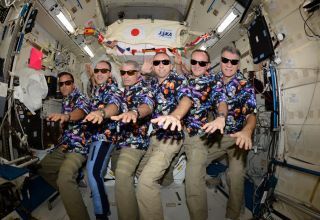 Crewmembers on the International Space Station celebrate "Aloha Friday," with space-themed Hawaiian shirts. Aloha Friday originated in Hawaii and is similar to "casual Fridays," but allows businesspeople to wear Aloha shirts to work on Friday during the hot summer months. Bresnik also posted a picture of Earth, full of reddish hues that may have been created by autumn leaves on trees. The astronaut did not state the region of the planet that was featured in the image.